WHAT EXACTLY IS A MEDICAL ALERT SYSTEM? It is a service that helps customers maintain an independent lifestyle by provided a guaranteed line of communication in the event of an emergency, usually by use of alert pendant worn by the customer. We have two types of service, Belle and In The Home, that can get you help no matter what. WHAT'S THE DIFFERENCE BETWEEN THE TWO SERVICE TYPES? Belle is our mobile medical alert pendant. It’s a powerful device that uses 3G cellular coverage to place calls to our monitoring center when the customer presses the emergency call button. 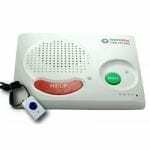 A built-in, two-way speaker and microphone allows the customer and ResponseNow operators to communicate and quickly determine the best course of action. Belle is great for protection both inside the home and outside wherever cellular coverage is available. In The Home is the traditional console-and-pendant setup. The console plugs into an electrical outlet and phone line. The customer wears a lightweight, waterproof pendant that when pressed sends the console into alarm. The console will connect to a ResponseNow operator who will then communicate with the customer via the console’s speaker and microphone. In The Home service also allows for extra pendants (great for couples who would like to share service) and fall detection pendants. WHAT HAPPENS WHEN I PRESS MY PENDANT? An alarm signal is sent to our monitoring center from your base station either over your home phone line or the cellular network. There are no charges to press your pendant so don’t be afraid to do so! Our operators receive the unique signal your medical alarm is distributing and will open up the two-way voice communication with all your pertinent information such as name, address and emergency contacts right there at their fingertips. From there, let the operator know what they can do to help. WHO WILL ASSIST ME DURING AN EMERGENCY? When you sign up for our service, you will be asked to provide names and phone numbers for emergency contacts such as friends, relatives and neighbors. In the event of an emergency, our highly trained operators will ask you who to contact. We will dispatch emergency services upon request or if the operator cannot communicate with the customer. WHAT IF THE OPERATOR AND CUSTOMER CAN'T HEAR ONE ANOTHER? This can happen occasionally but the important thing to remember is to stay calm, we’ll still be able to get the customer help. Our operators are trained to treat each signal as an emergency. Whether it’s dispatching emergency services or notifying the emergency contacts, we’ll take the appropriate action to ensure the safety and well being of our customers. CAN I TAKE THIS IN THE SHOWER? Yes! Both Belle and all In The Home pendants are completely safe for the shower. Please do not submerge any pendants in standing water. We strive to provide exceptional service at the best possible value for each individual customer. With three plans to choose from, we’re confident you’ll find the one that best suits your needs. We’re a national brand that’s kept the familiarity of a local, family-owned company. Our management has more than 30 years of life safety experience and we are committed to using that experience to help our customers to a better, safer way of life. I'M READY TO GET STARTED. HOW DO I ORDER? Great! We’re glad you’re ready to go. Either give us a call at 1-866-795-4321 and one of our helpful representatives will get the process started, or click here to order right now. Generally, we’ll ship your system the same day you place the order. If the order is placed on a weekend or holiday, we will ship the next business day. We ship USPS Priority Mail, which means your package will arrive in 2-3 shipping days (Mon - Sat). ResponseNow offers free USPS Priority Mail shipping on all quarterly or annual plan orders. Shipping for a monthly plan order or for individual accessories is $14.95. I NEED THIS RIGHT AWAY. CAN I EXPEDITE SHIPPING? Yes, shipping can be upgraded to USPS Express shipping for an additional $30. Please call 866-795-4321 if you’d like to upgrade your shipping. HOW DO I INSTALL MY SYSTEM WHEN IT ARRIVES? Your system will come with easy-to-follow instructions that detail exactly how to get started. If you have any questions, call us at 866-795-4321. WHAT IF I DECIDE RESPONSENOW IS NOT FOR ME? We understand that our service is not for everybody, which is exactly why we have our 30-day money-back guarantee. Simply give us a call to let us know you’d like to cancel and send back the system. Upon receipt of the equipment, we’ll refund your full plan payment. WHAT HAPPENS IF MY EQUIPMENT BECOMES FAULTY? ResponseNow is responsible for all service and repair of faulty equipment, as well any battery replacements. There are no extra costs for this. The medical alarm console and medical emergency buttons carry a complete lifetime replacement warranty. WHAT HAPPENS AT THE END OF MY SERVICE? Customers are responsible for mailing the equipment back to ResponseNow when they are ready to discontinue the service.